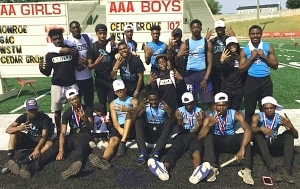 Coach Jermaine Smith’s Cedar Grove Saints wrote their names in the DeKalb County and GHSA record books with a thrilling come-from-behind 102-96 win over Westminster to capture the 2018 Class 3A Boys’ State Championship title at Hugh Mills Stadium in Albany last Saturday. The victory was the Saints’ fourth consecutive state title setting a new benchmark in DeKalb County and they became just the seventh boys’ program in state history to win four in a row. Cedar Grove trailed by over 30 points to Westminster heading into the track finals on Saturday but exploded for 88 points with five gold medal performances along the way. Cedar Grove still trailed Westminster 90-84 heading into the final event of the meet with two teams entered in the 4×400 meter relay and needing at worst 16 points to tie Westminster if Westminster won the event. The two teams responded with a 1-2 finish ahead of Westminster to clinch the title for the Saints. Deanthony Moore, Eric Davis, Oral Ashe and Terrence Lewin’s Team A raced to the gold in 3:18.92 while Team B consisting of Spivey, Cox, Tyvontae Stokes and Keshun Byrd took the silver in 3:19.93 to finish .56 of a second ahead of Westminster. As the final day opened, the Saints quickly served notice they were not going away as Israel Spivey, Kortney Cox, Dimitri Cooper and Terrence Lewin teamed up the 4×100 meter relay to grab a quick 10 points with their gold medal winning time of 42.13. Spivey and Cox added 30 more points in the 100 and 200 meter dashes. Spivey won both events with a 10.61 in the 100 and 21.70 in the 200. Cox was fourth in both with a 10.94 100 and 21.91 200. Jadon Haselwood defended his 110 meter high hurdles title taking the event in 14.38 to help set out the exciting finish. Keshun Byrd also contributed a gold medal in the triple jump going 47-04.50 feet for the win. Cedar Grove stands alone in DeKalb County with its four consecutive state track championships surpassing Druid Hills and Southwest DeKalb (1995-97) which had won three consecutive, Druid Hills twice (1951-53 and 1958-60). Only six other programs have won four or more consecutive boys’ state titles in GHSA history led by Landmark Christian’s 7 (1996-2002), Carrollton twice 6 (1955-1960) and 4 (1980-83), Cairo’s 6 (1968-73), Athens Christian’s 5 (2011-2015), Central, Thomasville’s 4 (1964-67) and Fitzgerald’s 4 (1987-90). The Lady Saints finished fourth in Class 3A with 31 points over the weekend. Antania Swain led the way with a great toss of 120-09.00 feet to win the discus competition. Southwest DeKalb and Miller Grove tied for ninth with Maynard Jackson and Bainbridge for Top 10 finishes in the Class 5A boys’ state meet at Carrollton. Nicholas Edwards accounted for all 18 of the Panthers’ points as the won the discus (175-03.00) and silver in the shot put (54-11.00). Miller Grove’s 4×400 relay runner-up finish in 3:16.29 accounted for almost half of Miller Grove’s total. Jordan Barrow finished second in the long jump (22-07.25) and sixth in the 100 meter dash (10.93) to account for 11 of Arabia Mountains 13 points to clinch a Top 20 finish tied for 19th with Hiram and Griffin. Miller Grove finished fifth in the girls’ meet with 40 points. The Lady Wolverines were led by Emoni Coleman who defended her 2017 800 meter run championship with a time of 2:12.51 and then collected her second gold medal with a victory in the 1600 meter run with a time of 5:03.98. Arabia Mountain had no one finish higher than fifth in the meet, but came in 15th overall with 14.50 points. Chamblee finished in a tie for 25th with Ware County and Locust Grove. Stephenson and Martin Luther King Jr. finished fourth (33) and fifth (25.50), respectively, in the Class 6A girl’s state meet at Carrollton. The Lady Jaguars were led by Simone Harper’s win in the 100 meter hurdles with a time of 14.52 along with a second place finish in the 4×100 meter relay (47.48) and a bronze medal win by Jayla Hernton in the triple jump (37-03.75). The Lady Lions grabbed gold in the 4×100 meter relay as Lauren Euler, Ayonna Dennis, Jaili Green and Kayla Hunt ran a 46.74. Hunt picked up a bronze in the 100 meter dash (11.91). Dunwoody got a Top 15 finish as its 20 point total placed the Lady Wildcats in 11th and just 5.5 points out of a tie with King. Ariel Lawrence put up 14 points for Dunwoody with a win in the long jump (19-04.25) and a fifth in the triple jump (36-05.50). Samantha Cameron collected a bronze in the 3200 meter run (12:00.68) to round out the scoring for Dunwoody. Stephenson also got a Top 10 finish in the boys’ meet taking sixth overall with 29 points. The Jaguars picked up a pair of silver medals with their performances in the 4×100 meter relay (41.57) and 4×400 meter relay (3:18.74). Martin Luther King Jr. Lions wound up a Top 15 finish in a tie for 13th with Lanier and Valdosta with 16 points. Jhivon Wilson was the team leader with 14 points on the back of his silver medal in the 100 meter dash (10.71) and a bronze in the 200 meter dash (21.64).